Engrossing tale of married life, old secrets and life on the land. Brianna Donahue and her father work the family farm while her husband works as a fly-in/fly-out lawyer in Perth. Her marriage is on shaky ground and she has been raising their two children almost single-handedly. It’s obvious she loves this life and where she and her boys thrive and that her husband loves the work he does too. How could she ever live anywhere else? When their son goes missing, memories rise of the day when Brianna’s mother disappeared and was never found. Although Trent is found, relatively unharmed, the incident leaves both Brianna and her father shaken, especially as her husband doesn’t immediately rush to her side. He eventually shows and their argument is bitter leaving her despairing how they can find their way back as a couple. As the long, hot summer days go by the threat of bushfire hangs over the land. Trent experiences nightmares, her other son becomes withdrawn, her father’s girlfriend insinuates it’s time for them to move in together and merge their respective farms – Brianna finds herself missing the mother she barely knew. What happened to her? In another state, Detective Dave Burrows becomes involved with an elderly farmer who suspects his sheep have been stolen. Dave brings the social workers in to assess when he believes the old guy has early dementia. In conversation the old man talks about his sister and a mysterious woman in the barn. Dave investigates further and discovers a deadly link between the old farmer and Brianna and her family. 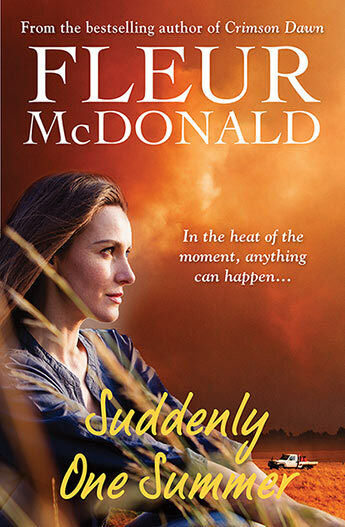 Suddenly, One Summer is an engrossing story and I thoroughly enjoyed this book by Fleur McDonald. I’m a recent convert to Ms McDonald’s writing and again, she didn’t disappoint with involved plots and wonderful characters. I loved the detail about the hardships and sheer volume of work involved in farming / raising sheep which was expertly woven into the narrative. I also loved reading about the challenges of a marriage well over the honeymoon stage and further insights into Dave Burrows’ life as a policeman and husband. There is some time flips between the past and present – beautifully situated in the story to enhance the suspense and drive the plot forward. This book kept me riveted until the end – I give it 5 stars. Suddenly One Summer was given to me as a free book in exchange for an honest review.